We all live in a world full of karma, you eat ice cream without me and you catch a cold. Karma is simply universe giving you back what you deserve, but some people deserve it so hard that even the universe shudders punishing them. Human evolution is a constant reminder from the universe that she still holds a lot of power on reality. As we progress so increases the population of hypocrites and self-righteous people who believe that the entire world is part of their own crazy ideas. Two days later, in their own team, a lady had to resign due to pressure from her inlaws, what was worst, it was very close to the delivery of the product. Somewhere lady karma was laughing. If these hypocrites are a problem in the evolving society, so are the number of pathetic ads that are rotting the society. I know you will talk about Ranbir Kapoor's pathetic act of the standup comedy does not qualify as a good ad, but the worst case of tumor comes from the advertisements of fairness creams. If the advertisements are to be believed entire Indian society is attempting to color their skins white in color and not only are those ads super bad but are highly racist. Taking about racist ads, did you happen to check those community matrimony advertisement? They seem to suggest than Indian kids cannot take their own decision and it is upto the community matrimony site to make this right. Obviously, Ranbir already is on bad books of lady karma, his movies are proof for it but due to these ads one of my friend tried to increase the shade of her own fairness for the matrimonial site, turned into a horrible shade of red. Karma just showed her the ugly side of fairness. Karma hits you when you are not looking and it is lady karma who knows 1300 degrees of marshal arts to get you what you deserve. 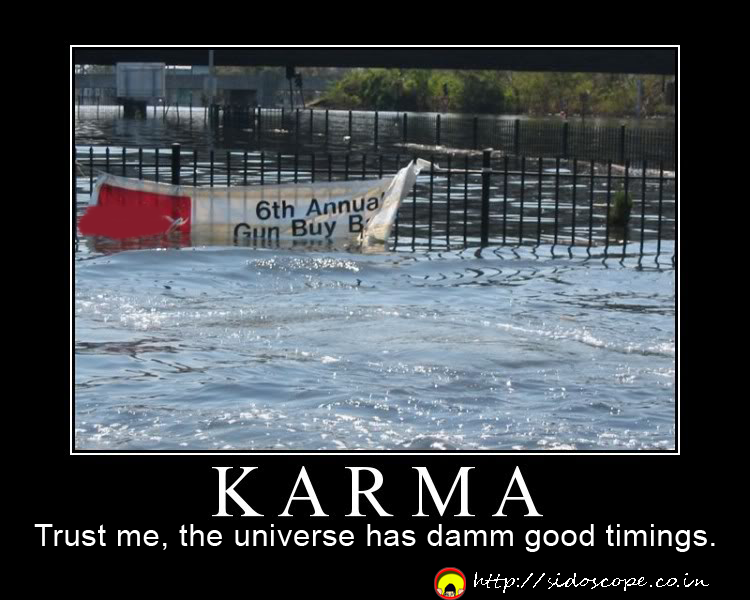 Company pays you less, it is companies karma, will hit them sooner or later when the time is right. 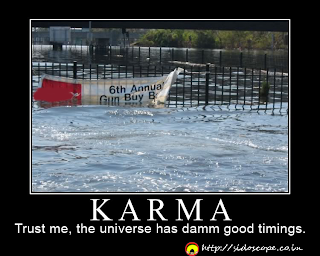 The best example of karma hitting back is Karna, right in the middle of war, the wheel getting stuck in a mud pit of the greatest warrior on earth, is not good right? They say, the oldest law in the book is, every evil has a double role, you do evil and evil will do you. Simple Honest. But obviously people won't listen, not until karma hits them, if they want it or no and it, remember one thing, Lady Karma is good at what she does and what she does might not be good for you. I don't know what to say..let me think more..! !